certainly not a change of mind and heart. those who tell lies, those who covet what belongs to others. But today is not a day for judging others. with our own participation in the human rebellion against God. We come face-to-face with the failures and brokenness in our own lives. which give concrete evidence of our rebellion. who have not feared, loved, and trusted God above all things. failing to keep God’s Word holy and gladly hear and learn it. even those whom we believe are the worst sinners before God. would be the worst offense on this Ash Wednesday. we have forgotten the promise and neglected the Word. we do so in hope. 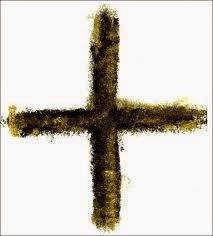 we would never celebrate Ash Wednesday. or we would blame God for them. in the shape of the holy Cross. he also took on our sins. and bore them all in his body. all of them carried by Jesus the innocent one. Jesus too sat in the ashes of repentance. was the repentance he made for us. and upon all the people with whom he shares everything. and for them walked the way of the cross. dies for us and is raised for us. and with the God who saves us.